There's a thread on neighbourly at the moment with that age old issue of how to manage fusspot kids at the table without everyone going insane! As a family, we struggled with this when our two hair-shirts were small. Even now, aged almost-10 and 12 years old, we have our moments! 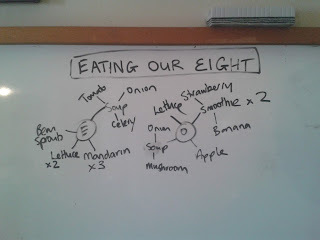 We got totally sick of being the "plate police" - so we started an "eating your eight" policy. Photo: Our kids are bigger and we are no longer "writing up", but, out of curiosity while writing this post I reproduced how the kids would have done yesterday. As parents, we believe that providing superb nutrition is one of the most important things we can do for our children. Kids, on the other hand, aren't always the most cooperative when it comes to this goal. We hit the usual brick wall when our beautiful babies stopped gobbling up the homemade pureed goodness of meat and veg and became toddlers exercising that favourite word "NO". Particularly when number 1 can teach number 2 to become fussy earlier than he otherwise might have been! We set a goal for eight servings of fruit and veg per day. Why eight? Well, any number you pick is going to be arbitrary. Eight seemed to overshoot the goal of five, so we figured on days where the kids missed their target, then their C+ effort would still be OK nutritionally (spot the A type personality parent!!!). Eight also fitted into a slogan nicely: "Eating your 8". It's all about priorities, people! This policy wasn't perfect, because nothing is (and we certainly aren't!) but it worked pretty well for our family at reconciling our values of healthy eating, respecting our kids' individuality and trying not to make a rod for our own backs as parents! 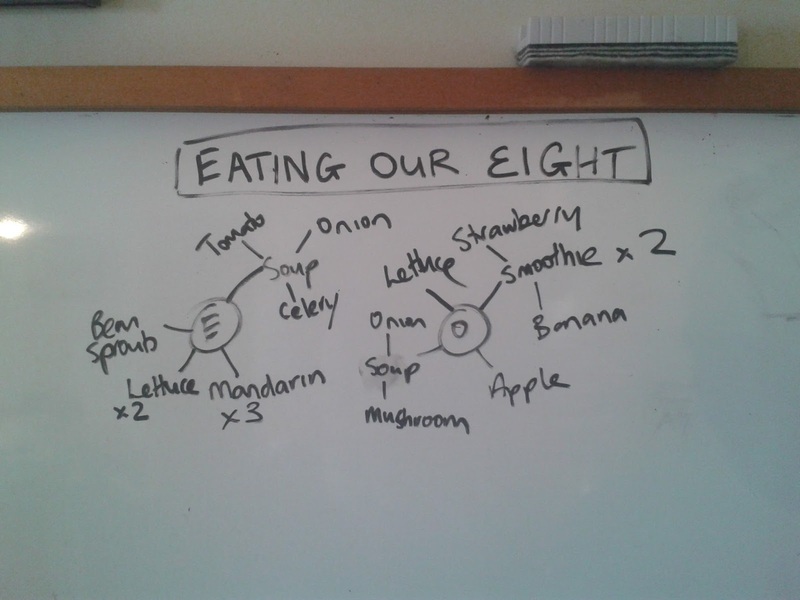 I wrote on the white board servings of fruit and vegies eaten through the day. This involves bonus literacy and numeracy (again with the A type parenting)! If the child chose to eat eight servings of fruit and veg during the day, at dinner time or not, then he got "dessert". Dessert comprised unsweetened greek yoghurt with about 1/4 teaspoon of hundreds and thousands on it! Now that we are sugar-free, dessert is a juicy jelly or pannacotta grabbed from the stash in the fridge, or yoghurt and frozen blueberries (for the one who likes blueberries), or yoghurt and carob (for the one who likes carob). The point is having a wee reward that doesn't undermine your work teaching sensible choices through the day, this should be whatever works in your house for your family. We found this worked because the kids wanted to choose healthy and quickly learned to self monitor, e.g. choose some kiwifruit at morning tea instead of just crackers. We felt this was more valuable than turning dinner into a standing battle (which was what was threatening to happen). We still presented small servings of dinner to try with no pressure beyond the first mouthful. I think this means that kids can give something a go in good faith and they are more likely to like it. A quick assessment of the white board at dinner time, meant that they could think about their day and what was needed to qualify for "dessert". Within a couple of days, a boy could often be seen counting up and then asking about what was for dinner and suggesting maybe we could have broccoli as an accompanying vegetable so he could hit his target. One unexpected outcome was the effect on toilet training. We developed and instituted this policy when our youngest was 2 1/2 years old and we were toilet training. Number ones were a breeze. Number twos were scary. He would often go and hide and make a mess. We thought our diet was pretty good. However, when we started this we found the kids often overshot their targets with enthusiasm for fruit and vegies at morning tea and afternoon tea time. Suddenly, youngest boy started to be able to predict number twos and not fear them. I think he was a bit blocked up and it may have been a bit painful for the poor wee guy! Anyway, toilet training was easy after "Eating Our 8" began. As the kids have grown bigger, we don't use the white board anymore, but they have expectations about what normal healthy food is. A lunch box always has at least three servings of fruit and vegetables. Afternoon tea always has at least one or two pieces of fruit. At dinner you can expect at least three servings of vegetables. We expect a good go at dinner. The kids are very good at eating the vegetables we commonly serve as a family with our meals, such as broccoli, cauliflower, cabbage, raw carrot, lettuce, peas and corn, and each likes a variety of other common vegies that the other one doesn't like. Yes, I do "sneak" grated courgette and/or carrot to up the nutritional game. Split red lentils are good for this, too. (See Beef Up Your Meat Meals). The kids now know that I do this and see it as a legitimate way to get their nutrition despite their tastes. Frankly, even as an adult it's nice sometimes to just eat a hearty casserole, packed full of vegies and not think too much about them! There are certain things the kids just don't like, they have NEVER liked and probably never will, e.g. our eldest boy has never eaten a banana in his life, not even when he was a baby (except for that one afternoon he crawled into the dog motel and became a caged monkey for 3 hours). We are glad we haven't forced the issue. We don't expect them to eat something they genuinely hate, that's just something adults do to children because children are smaller than they are. If the family is eating something a kid just can't stand, our rule is they must make sensible alternative choices and they are responsible for these, e.g. 12 year old doesn't like texture of many foods including rice. So when the family eats rice he pops a couple of potatoes in the oven and has jacket potatoes as his carbs. I believe kids learn about their nutrition and their choices by allowing them some control and choice in the matter. This means that we are not just feeding their bodies with good food, but educating them about good choices and instilling them with self control and self assessment.